Valentine’s Day is one of my favorite holidays, but like most holidays…it can be stressful as we try to make it cute…creative…thoughtful…(the list goes on). At our house, Valentine’s Day is further complicated by the fact that it is also my husband’s birthday! When I was young, my mom always made a spaghetti dinner with red and white decorations and gave us all little gifts. I struggled to carry on this tradition without taking away from my hubby’s special day. He did not appreciate me giving the kids lavish gifts on HIS birthday (although I have made it perfectly clear he is still under obligation to get me something!). The house is a little bare after all the Christmas decorations are put away. It is fun to decorate with a splash of red and white but you don’t have to break the bank. Check out these fun ideas! My kids LOVE creating their own valentines to distribute to classmates and friends. We have a great time creating cute sayings to go with inexpensive items we find at the Dollar Store. We focus on a heartfelt note rather than an expensive gift. We take time to write notes of appreciation to school teachers, dance teachers, and mentors. It’s fun and gives my kids the chance to express gratitude and kindness. We started this tradition when our kids were little and haven’t missed a year! Instead of gifts, we “heart attack” our kids! We cut hearts into different sizes and write unique things that we love about them or amazing things we have noticed they’ve done lately. We try to be specific….”You are a great singer! I loved your performance last week!”…” You are such a great student! You always get your homework done on time!”….”I love your smile! You brighten my day!” We stick the hearts all over their bedroom doors and they look forward to it every year! In case you haven’t noticed: flowers are super expensive on Valentine’s Day! Instead of sending flowers to my son’s girlfriend, we created a love package and mailed it to her. We put in a few of her favorite snacks, socks, a bath bomb, fun pens, etc. We attached a sappy saying to each of the items and wrapped them up in a package adorned with pink and red hearts! One year my husband wrote me a poem. It was so cute and super sweet! Why buy an expensive card when you can create a few lines of prose that are unique as he is?! You may not be Shakespeare, but give it a try and you will be surprised the fun things you come up with. This time of year, many of us are trying to shed some extra weight we accumulated around the holidays so a box of chocolates is NOT what we want for Valentines Day! So if you care about your significant other and their healthy resolutions, coupons might just be the ticket! Think of the things they love the most and create coupons they can redeem. A long back scratch or massage… a car wash or shoe shine…or even a quiet movie night at home. Valentine’s Day should be one of the best days of the year because it is all about the people you love and you can definitely show your love in simple and thoughtful ways without breaking the bank! 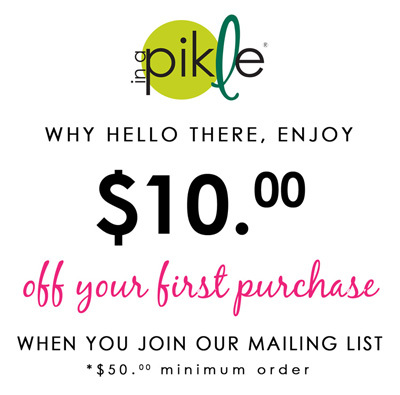 Don’t forget: the In A Pikle products are a perfect little gift to show how much you care! It is the gift that keeps on giving and it’s calorie free! This entry was posted in In A Pikle and tagged bath bombs, chocolate, Christmas, coupon, coupons, decor, dinner, fondue, gifts, girlfriend boyfriend, heart, heart attack, hearts, holiday, homemade, homework, In A Pikle, love, PETITE, singer, smile, spaghetti.